MOUNTAIN VIEW, Calif., Aug. 21, 2014 /PRNewswire/ -- Diamond Systems, a leading global supplier of compact, rugged, embedded computing solutions for real-world applications in a broad range of markets, today introduced Emerald-MM-8EL-XT (EMM-8EL-XT), a family of high performance PCIe/104 OneBankTM serial I/O modules offering 4 or 8 serial ports with software-controlled configuration and optional opto-isolation. The serial ports are based on a high speed PCIe octal UART with 256-byte TX/RX FIFOs and auto RS-485 transmit control. Each serial port can be independently configured for RS-232, RS-422, or RS-485 protocols, along with programmable 120-ohm line termination. Each port is independently isolated with an isolated power + signal chip, plus additional isolators for control signals. The board features intelligent power management that limits inrush current on power-up and also enables power-down of unused serial ports for power savings. Opto-isolated models feature independent 2500V isolation circuits for enhanced reliability in vehicle or long cable applications. All ports also feature +/-15KV ESD protection. Each serial port is available on an independent latching connector for increased isolation and ruggedness. With its wide operating temperature range and high resistance to shock and vibration, the EMM-8EL-XT fits a wide variety of rugged and on-vehicle embedded serial I/O application needs. EMM-8EL-XT also offers 8 digital/analog I/O lines which are programmable from the on-board microcontroller. Each I/O line can be configured for digital input or output. Seven of the I/O lines can also be configured for 12-bit A/D input with selectable 0-2.048V or 0-3.3V input ranges. 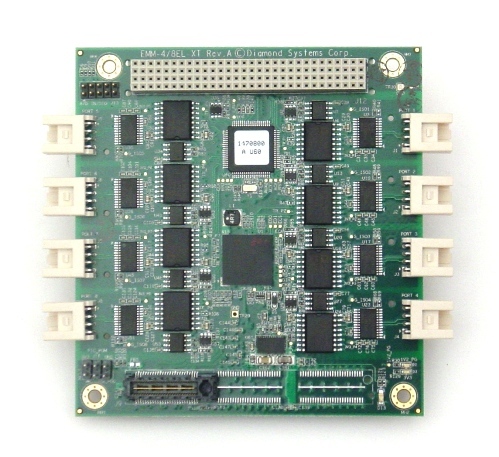 EMM-8EL-XT contains no configuration jumpers; all configuration and control is done with an onboard microcontroller. All configuration settings are stored in the microcontroller's flash memory and are automatically loaded on power-up. The microcontroller is managed with a comprehensive software suite that makes configuring the EMM-8EL-XT fast and simple. A graphical control panel, a console application, and drivers for Windows and Linux are provided to enable convenient configuration of the board and control of the I/O features in a laboratory or system assembly environment, or embedded in the customer's application software. EMM-8EL-XT is compatible with Windows 7/Vista/2000/XP and Linux and is qualified for operation over the full industrial temperature range of -40oC to +85oC. EMM-8EL-XT's key features and functions are tabulated below. The Emerald-MM-8EL-XT PCIe/104 serial module family is available immediately. See the table below for specific model information. Single unit pricing starts at US$675 for the EMM-8EL-XT model. Founded in 1989 and based in Mountain View, California, Diamond Systems Corporation is a leading global provider of compact, rugged, board- and system-level real world embedded computing solutions to companies in a broad range of markets, including transportation, energy, aerospace, defense, manufacturing, medical, and research. The company is renowned as an innovator of embedded I/O standards and technologies; it originated the FeaturePak I/O modules standard, was an early adopter of PC/104 module technology, and holds a patent for a unique analog I/O autocalibration technique. Diamond's extensive product line includes compact, highly integrated single-board computers (SBCs); an extensive line of expansion modules for analog and digital I/O, wired and wireless communications, GPS, solid-state disk, and power supply functions; and complete system-level solutions. In support of performance-critical embedded application requirements, these products are engineered to operate reliably over wide operating temperature ranges, such as –40°C to +85°C, and at high levels of shock and vibration. Additionally, the company offers a comprehensive hardware, software, and system integration and customization services. For further information, please visit www.diamondsystems.com or call +1-800-367-2104. Copyright ©2014 Diamond Systems Corp. All rights reserved. The Diamond System logo is a trademark of Diamond Systems Corp. All other company and product names mentioned herein may be trademarks of their respective companies.